High up in the Jungfrau ski area, Reachable only by cable-car, the car-free resort of Murren sits on a sunny plateau at 1650m and boasts incredible views. Less crowded than its more popular neighbour Wengen, the resort gives easy access to the Jungfrau ski area. Offering breathtaking mountain views and a relaxed atmosphere, Mürren offers a traditional destination that is unforgettable. Located above the Lauterbrunnen valley, the car-free village seems to take you back in time. Mürren combines traditional folklore and food to give you a taste of its history, while a large number of shops and restaurants mean you have everything you could need at your fingertips. There's also an Alpine health and sports centre that gives you access to a range of amenities, including a sauna, swimming pool, library and solarium. 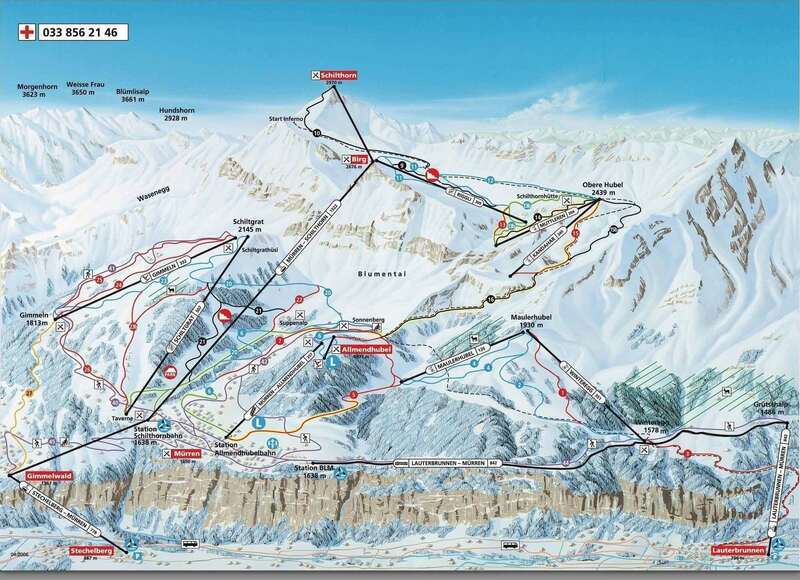 The resort also offers a cable car, chair lifts and ski lifts to allow you to access a range of great runs. The season in Mürren runs from the start of December to the end of April, offering a good amount of powder, especially the higher up you go. You'll find that snow coverage tends to be good even if the rest of the region isn't seeing much powder, making Mürren an ideal destination. Murren offers 53km of downhill pistes in the Murren-Schilthorn area, with the other 160km in the Jungfrau area easily accessible. There is a reasonable mix of terrains for skiers in Mürren offering suitable runs for beginners to more advanced individuals. You'll find the best slopes between 1,500m and 3,000m, which offers some more challenging fast descents and off-piste terrains if you really want to test your skills. Expert base jumpers will be in their element, as you'll find 800m vertical descents offering drops from the cliff tops to the valley that will really get your heart racing. 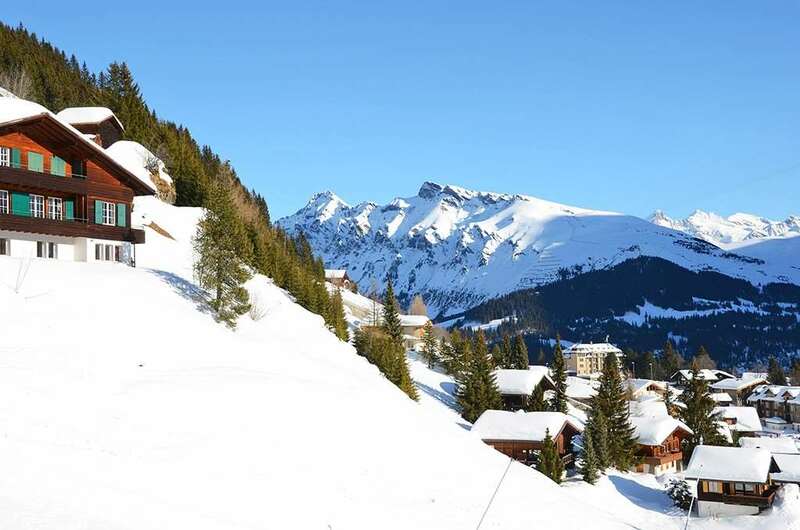 There are lower runs for beginners, although these often don't see as much snowfall as the higher pistes, so you may be relying on snow machines for optimal cover. No matter what your level of expertise, you'll find skiing in Mürren fantastic for the expansive and breathtaking views alone. While Mürren is reasonably quiet and quaint, it does have some great activities and places to visit beyond the slopes. There are a number of great bars and restaurants, offering modern cuisine and traditional dishes. The revolving restaurant atop the Schilthorn mountain as featured in the 6thJames Bond film, "On Her Majesty’s Secret Service" is a must see whilst in Murren, Switzerland. For those who want to spend some time off the slopes, the sports centre is a great way to spend the day. Here you'll find a range of facilities, including spa provisions, a pool and ice rink. There is also an all-purpose sports hall and a squash court, so you'll be spoilt for choice. You can reach Mürren from a number of airports, although flying into Berne gives you the shortest transfer as it is just over an hour away. You can also travel to Mürren via Lauterbrunnen station, which will have you in the village in around 40 minutes.